The Maybelline Lasting drama gel liners are highly concentrated pigments in a clear gel base and claim to be smudge-proof and waterproof for 24 hours. 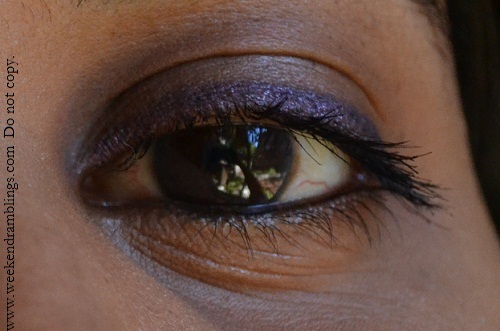 Having already tried out the shade Charcoal/Charbon - a shimmery grey liner - I moved on to the eggplant/aubergine shade. 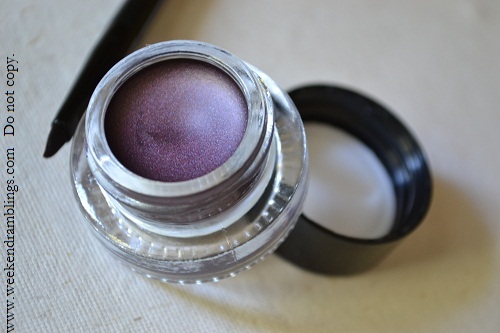 True to it's name, this is an eggplant shade with a very fine shimmer to it - not glittery chunky particles but a very fine shine. 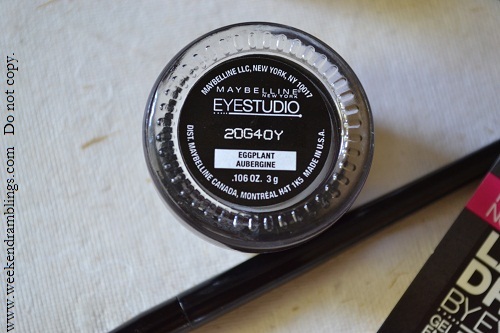 As with all of Maybelline's gel liners, this too comes in a classy glass pot packaging with a very useful brush included with it. The liner goes on quite smoothly - the best application, I found, was with the included brush rather than with my usual trusty angled liner brush. The swatches come out the same shade as in the pot and while they are reasonably water and smudge proof, I find that not waiting for the liner to dry fully can lead to some of the colour transferring to the crease - definitely not a very neat look! I haven't had this problem with the more expensive MAC Fluidlines, but I guess that's a compromise one would have to make with the price difference. 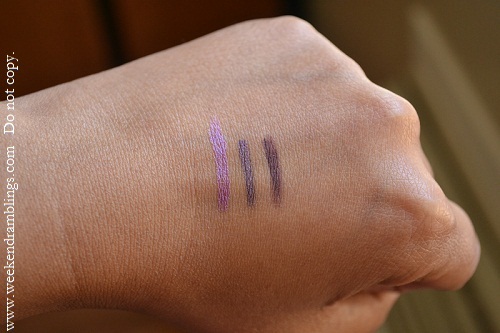 Overall, I like the colour and the consistency of this eyeliner. It is easy to apply and stays on long enough. However, I do wish they would set/dry faster and not transfer on to the crease area. Ensure that you clean/wipe off the brush after each use or it tends to get hardened and difficult to use. Priya - I read you are reallly reallllly busy..what are you busy busy with so much?? hmmmmm.. :D :D But it looks soo prettttttty..me wantttttttttt.... sigh!! I just love this colour, wish they launch it in India really soon. I was eyeing this for so long... soemhow didnt get it.... but if its transferring to the crease then I dont think I hsould :(( but such a grt shade naa!! I don't know how I missed it in Singapore. Grrr. Gargi - my blog hungry..forever eating up comments :D It is pretty na? 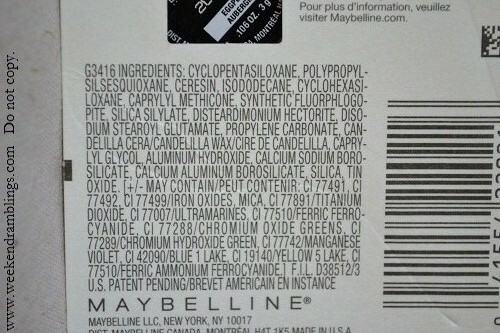 Maybelline should introduce all this in India also.. It's a change from our usual brown black liners naa..when will your cousin get back to India? I am new to your blog and new to eye makeup too. I am currently using Lakme Perfect Definition Eye Pencil on my waterlash but it seems to go away within 1 hour only. So, I went to buy Maybelline Colossal Kajal after reading its gud reviews, but the SA told that if ur eyes are watery, then buy drama gel eye liner and also its waterproof. 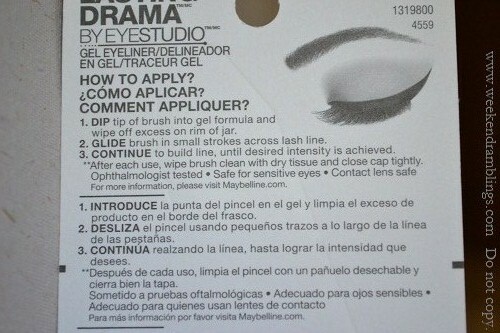 I wanted to know if this liner can be used on waterline too? I still have to learn to use it on upper lash also. I am so glad that u replied to my comment. Ya, I have the black gel liner. I applied it today on my waterline in 2 swipes, but just like Lakme eyeliner, it disappeared after 2-3 mins, then applied again and checked after 45 mins, then it looked like a faint thin line was applied. A friend of mine applies it at waterline only. What should I do? But, I really like the brush, its so easy to use, even for a newbie like me. Ohhhoo..no thank you and all. I love getting comments :D :D I think you can skip the maybelline lner then for your waterline - just my opinion..I have seen many people who have these dark lines on their waterline, but somehow I never get it. I think the reason is my eyes are more watery, get irritated easily kinds - so I have finally decided some people are lucky they can use whatever they want on their waterlines, not so for me. 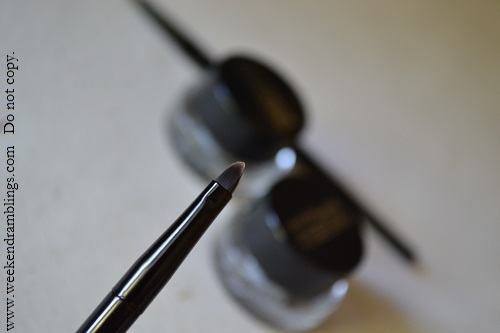 Have you tried Avon Glimmersticks black? It's a plain black pencil twist up liner, and it's quite black, though of course not as jet black as these gel liners or kaajal but it's good. 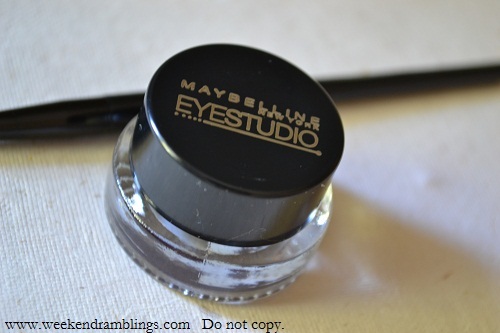 It's waterproof, and it stays better on my waterline than most other products. Not the Glimmersticks diamonds with shimmer..just plain black..do give it a try if you have any Avon person near your place :) I LOVE the maybelline brush too, and you can maybe buy Maybelline for your upper lashline though. Now toh I have to learn to use it on upperlash else if I don't use it, my mom will beat me, kyunki baddi mushkil se I convinced her to buy and promised that I will not waste it. It's easy enough Shruti..you apply like dots or dashes and then join them in short short strokes - is easier than trying to draw steady lines at once. I am sure you won't waste it - just make sure you keep the lid tightly closed and keep the jar standing on the lid - like upside down - instead of it's base. That way the liner will stay longer. When u r free, just ping me.